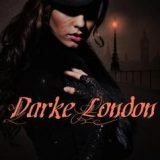 Darke London by Coleen Kwan is the first novel in the Uncanny Chronicles and offers a nice blend of historical romance, suspense and steampunk. With its colorful characters and heated romance, I quickly devoured this tale. Three word review: engaging, original and fast-paced. In February I read and enjoyed A Conspiracy of Alchemists the first book in the Chronicles of Light by and Shadow by Liesel Schwarz. 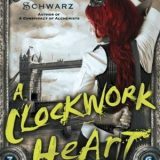 So, when an ARC became available for Clockwork Heart, book two I immediately dove in. Schwarz took this tale to a darker level, with multiple POVs and left me writhing on the floor. Three word review: action-packed, dark and disappointing. Hell and Winter Bronze Gods was good! 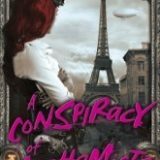 A.A. Aguirre blends together noir, steampunk, a pinch of fantasy and paranormal with a generous portion of mystery and suspense and then she adds brilliant characters. All of which create a tale that quickly captured my attention and allowed me to slip into the pages. Three word review: suspenseful, charming, and impressive. 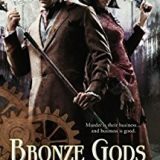 I remember when I picked up the novella The Strange Case of Jayne Finley back in 2011 and fell in the love with the quirky character and Kady Cross’s version of steampunk and suspense. It’s been a love affair ever since and each novel adds more depth to the characters as it delivers an action packed tale. The Girl with the Steel Touch delivers the most romantic tale of the series thus far. We see character and relationship growth all while fighting our favorite nemesis. I was captivated from page one and cannot wait for the next book in this series. I get a little nervous when someone says a book offers a blend of genres as nine times out of ten one of those genres suffer and usually it’s the one I bought the book for. So it was with trepidation that I began reading A Conspiracy of Alchemists by Liesel Schwarz. My fears were quickly put to rest as I slipped into this delightful steampunk fantasy wrapped in paranormal and historical elements. I found I could not put this action packed tale down and quickly consumed it. 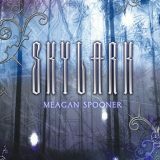 When I read the synopsis for Skylark I was immediately drawn to this dystopian type fantasy. I am delighted to tell you that it delivered a magical, dark dystopian world with a touch of steampunk. Spooner’s depiction of this world was refreshingly original with fleshed-out characters and a tale that kept me reading through the night. 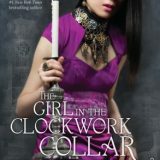 The Girl in the Clockwork Collar is the second book in the Steampunk Chronicles by Kady Cross, and the third about protagonist Finley Jayne. This time we cross the Atlantic to rescue Jasper. Cross delivers a plot filled with suspense, a dash of romance, history, awesome characters and amazing gadgetry. I love the steampunk genre and Cross has earned herself a permanent place on my bookshelf. 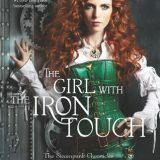 If you have not read The Girl in the Steel Corset,(click title to see review) I strongly advise you to stop reading, as this review might contain spoilers regarding the first novel.